I just had the Stone Smoked Porter and craved another of Stone’s line-up. G-LO has reviewed a bunch of their beers (the Levitation Ale, the Highway 78, the India Pale Ale, and the Belgo Anise Imperial Russian Stout), and the quality and variety of their line-up is impressive. I thought the high ABV would be a nice counter balance to the meat and cheese. Not your typical chili beer! The famous mild green chilies from the Hatch Valley in New Mexico add layers of delicious flavor with a very mild heat component. The base beer itself is very reminiscent of a European amber beer, with Perle and Pacific Jade hops, Munich and other roasted German and Belgian malts, hopped and brewed to a very Stone like TBD IBU and 9.4% abv. Cinnamon is a wonderful spice if used judiciously, which we did here-it doesn’t by any means dominate the beer’s flavor, but definitely adds a subtly complex spice note that blends amazingly well with the banana esters and green chili. Appearance: Clear, ruby color with good foam and lacing. Aroma: Sweet malt, fruity, grapey with just a hint of spice and hops. Taste: A little winey, fruity with a slightly hoppy, bitter finish. This was a very flavorful beer, but I found that it was, to steal from G-LO, a little boozy. The beer was very strong, but a good compliment to my mushroom cheese steak. I only wish we were a little closer to Dominick’s Side Door Pub. I’ve been wanted to try this. Have you tried any of their other Vertical Epics? I’ve been told this beer is quite nice after it has aged for about 5 years. I haven’t had the good fortune of trying any of the other Vertical Epics. Of course, having had this one, I would imagine that the beer would hold up if it were aged. I might get a bottle or two and test this theory. I actually didn’t care for this year’s beer. I like spicy food, and I like beer, so I thought I would like this. I don’t remember what I didn’t like about it as it has been a few months, but I ended up pouring it down the drain. I enjoyed the previous two years quite a bit and I love the concept, but this year (2011) was just a miss for me. You poured it down the drain. Oh, the horror! Of course, not every beer is to everyone liking. I hadn’t tried any of the previous formulae so I can’t offer an opinion on whether there was a change this year over last. I can say that I had mine on tap so the freshness was guaranteed. I would suggest that either something was lost in the bottling process or maybe you got a bad bottle. Despite the fact that they want you to collect and age every single year’s bottle until they hit the end (12/12/12), every year’s style is different. So I didn’t care for 2011’s style. 2009 was a Belgian Porter with spices that was delicious. Hmm … Collecting beer until 12/12/12? 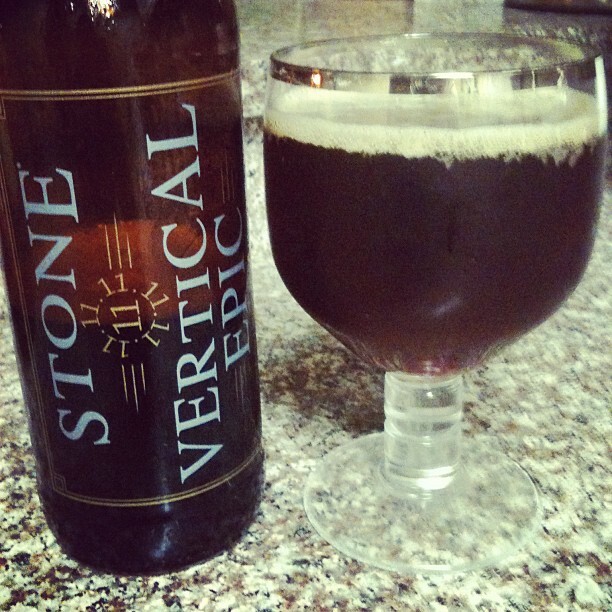 Should we plan a Mayan Apocalypse Stone Vertical Epic Ale Vertical tasting? Someone should email Miracle Max and set this up! !